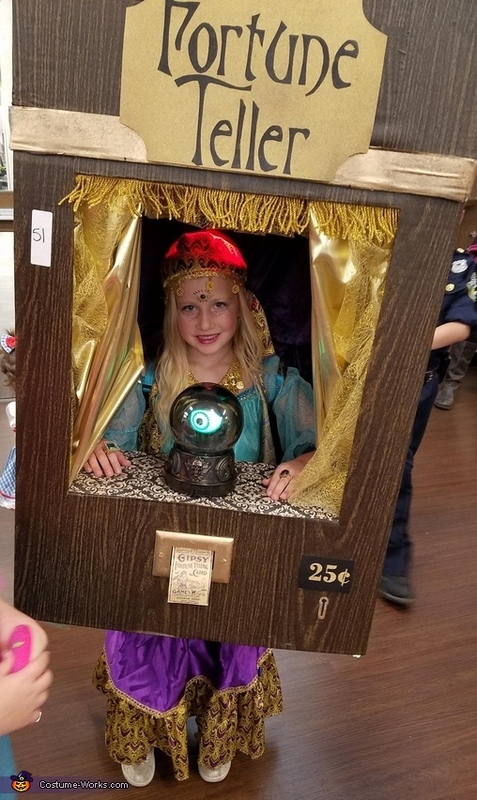 This is my daughter Cloey, and she is a Fortune Teller Machine. When we went to Wisconsin Dells, she was obsessed with the electronic Fortune Teller Machines. She was actually a little afraid of them, but loved them at the same time. She believes you should be something spooky for Halloween. Since those machines spooked her a bit, it was a fitting costume. The box was just a cardboard box covered in contact paper with some gold fabric and fringe for curtains. It is attached with shoulder straps and a belt around her waist.